Bournemouth - home to pensioners, piers, pantos and, from next season, Premier League football. The club who were once so penniless they required a bucket collection to survive now find themselves mixing it in the billionaires' playground of English football's top flight. Just seven years ago they were five minutes from liquidation, a year later they were a game away from going out of the Football League. Now, after a 3-0 win against Bolton which means only a loss, a Middlesbrough win and a 20-goal swing on the final day can deny them, they are celebrating a different piece of club history - playing in the Premier League for the first time. Bournemouth's place in the elite of English football is a far cry from the financial problems the club has experienced over the past two decades. In January 1997, the club were so penniless a bucket collection was arranged at the Winter Gardens in Bournemouth town centre. Players attended, money was raised and under the guidance of former chairman Trevor Watkins, Europe's first community club was formed as they came out of administration. "I don't think many of us Bournemouth fans could have dreamt this was a possibility," Watkins told BBC Sport. "We were down on our knees and collecting money in buckets. Current manager Eddie Howe was a player when the fans led the rescue. Our assistant manager Jason Tindall was one of the first signings the supporters' trust made at the end of the first season. Steve Fletcher was a player and they are all still together with that passion, spirit and togetherness." That rescue act did not signal the end of the club's financial troubles, though. Problems continued and in 2008 the Cherries were placed in administration for the second time in just over 10 years. Gerald Krasner of Begbies Traynor was appointed as the man tasked with saving the south coast club - who had debts of around £4m at the time. Krasner recalls one particular occasion when he came within five minutes of closing them down. "There was one press conference at 12 o'clock when, at five to 12, I didn't know if I had the money to continue trading," Krasner told BBC Sport. "I came within five minutes of liquidating the club. "It was only through the good grace of its current chairman Jeff Mostyn, who came up with the money for the next month, that the club came through that ordeal and successfully out of administration." Krasner revealed Mostyn paid out sums running into "hundreds of thousands" and never imagined they would be in the Premier League during those dark days. "I can't honestly say I ever envisaged a time when Bournemouth would be in the Premier League in such a short time," he added. "When I see them on Match of the Day next season I'll just have a big smile on my face." While the club survived administration they did not survive relegation and began the 2008-09 League Two season with a 17-point deduction and a transfer embargo. Things looked grim for the Cherries and when Jimmy Quinn was sacked on 31 December, the club appointed Howe as manager. He led them to a remarkable escape, with Fletcher's goal 10 minutes from time against Grimsby in their last home game of the season confirming survival. "I vaguely remember the commentary 'It's Fletcher…Legend!' as he smashed home a loose ball in the box," recalls BBC Radio Solent commentator Laurence Herdman. "The big man ripped off his shirt during the goal celebration in front of the main stand revealing a muscular physique and rippling bodybuilder biceps. The goal kept AFC Bournemouth in the Football League and the Great Escape was complete." All those struggles will now seem a world away as they prepare for life in the most popular - and most financially rewarding - league in world football. "The reach of the Premier League is extraordinary," said Trevor Birch of business advisory firm BDO. "It's now in over 200 countries and it reaches four billion people, so Bournemouth are going to be catapulted into the world's view." 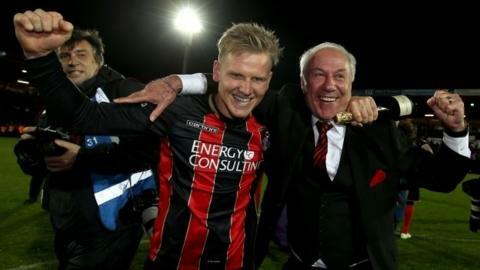 Howe, 37, has only been a manager for six years but has already achieved enough to be named as the first Football League manager of the decade. He first arrived at the club as a shy 13-year-old defender and went on to break into the first team, establishing himself as a key player. Injury forced his early retirement from the game in 2007 but the lessons he learned as a player from various coaches were soon put into practice as a manager. He was just 31 when he first took charge of the Cherries in January 2009, becoming the youngest boss in the Football League in the process. Meticulous in his preparation, Bournemouth's style as they have gone through the leagues has never altered, with Howe sticking to his philosophy of free-flowing, passing football. In two spells he has guided them to Football League safety, promotion into League One the following season and - after a brief spell as manager of Burnley - a rise from the foot of League One to promotions to the Championship and, now, the Premier League. Harry Redknapp has always been considered Bournemouth's greatest manager - but even Redknapp accepts his status has gone. "I had 10 years at Bournemouth and I was the most successful manager in their 100-year history. Eddie Howe has come along and blown me out of the water. He is fantastic - I love watching them play. "If I wasn't involved next year, I'd buy a couple of season tickets and watch them every week." So little is known of Bournemouth's mystery Russian millionaire owner, Maxim Demin, he could wander through the town centre and not be recognised. He was introduced to the club by former chairman and owner Eddie Mitchell, who had been building Demin's house in Sandbanks. As time passed his influence grew, he became co-owner in 2011 and bought out Mitchell in 2013. In 2012 Maxim Demin's wife made headlines after giving the Cherries a half-time team talk. "Mr and Mrs Demin have put a lot of energy, a lot of time and a lot of hard work into this club that has got us from the brink to where we are now," Eddie Mitchell told BBC Sport in 2012. "I'm not going to deny them the opportunity to speak to the players who they indirectly employ, and pay their wages. We are a family club, we believe in expressing our gratitude to everybody who has got a penny or a pound to spend on this club." Demin is based in Switzerland and is said to have been too superstitious to attend games during their run-in this season. He has made his money in petrochemicals and transformed the club both on and off the pitch. He is yet to give an official interview but Krasner is in no doubt how big his influence has been. "He's made the difference between Bournemouth being just another Championship club fighting for survival and now having Premier League status," he said. "The manager and the owner seem to work very well. If the owners and manager work well together you've got a much better chance of success." The Cherries began the campaign with a 4-0 victory at Huddersfield, which sent them to the top of the Championship. It set the tone for the rest of the season. Six weeks of indifferent form followed before a 2-1 victory over Bolton sparked a six-game winning run that sent them back to the summit. From 4 November onwards, the club did not drop out of the top six as they held off the challenge of former Premier League clubs Middlesbrough and Norwich. Their 8-0 win over Birmingham in October was the first time they had scored eight in a league game, barring a 10-0 win in 1939 which was expunged after World War Two broke out the next day. More club records would tumble: most league goals in a campaign, most away league wins, most away league goals, highest points total, best league finish and the ultimate record: first time in the Premier League. All this was achieved on a relatively small budget, with the arrival of Callum Wilson for around £3m their big summer outlay. The majority of the squad were the players that helped achieve promotion from League One. "This is the best Bournemouth side I have seen going back to 1986," former Cherries defender John Williams told BBC Sport. "I speak to fans of 50 and 60 years and they say they have never seen such dynamic football." The Cherries recorded an annual turnover of £5.1m in their last official financial results. The figure is about to be dwarfed by the riches awaiting them in the Premier League. The club lost £15.3m in the financial year ending July 2013 and in total, their net debt is just over £15.5m. They only just passed Financial Fair Play regulations earlier this season. "A prudent estimate for a newly-promoted club is upwards of £120m," Sheffield Hallam University football finance expert Rob Wilson told BBC Sport. "We are looking at a figure of anywhere between £100-£120m in terms of the value of promotion and the lion's share of that will come from television broadcasting. Depending on how well the club can leverage commercial and sponsorship opportunities you are talking about another £20m." Making the most of such opportunities might be a challenge for the Cherries, particularly since no club has ever been in the Premier League with a smaller stadium. And if they are to survive in the top flight, Howe may want to break the club's transfer record. That was set last summer when Wilson, who has gone on to score 23 times this season, joined from Coventry. A busy summer awaits on the south coast.